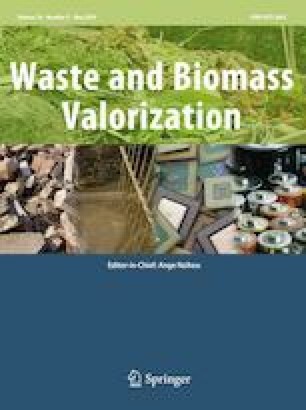 The main objective of this study is to investigate the characteristics of corn straw pellets conversion to syngas using a steam gasification process in downdraft gasifier. A lab scale gasifier was built to perform the gasification experiment. The effects of temperature and steam flow on the non-catalytic gasification process were investigated, and the variation rules of gasification indexes such as product component were summarized. Based on the principle of gasification thermodynamics, the reason of the rules is analyzed. The experimental results clearly indicate that hydrogen-rich gas can be prepared by using downdraft gasifier. When the temperature is above 750 °C, volume fraction of H2 in product gas is higher than 50%, little variation with temperature is observed, while it can be increased significantly by increasing steam flow. The maximum H2 content of 56.7% is obtained at steam flow of 1.2 kg/h, and the volume fraction of H2 + CO can reach 94.62%, the range of LHV is 9 ~ 11 MJ/Nm3. At 950 °C, the gas yield and carbon conversion rate reach 2.06 Nm3 and 91.6%, respectively. This work was supported by Natural Science Fundation of Inner Mongolia of china (Grant No.2015MS0106), The Inner Mongolia Autonomous Region university research project(Grant No.NJZY16159), and Natural Science Foundation of China (Grant No. 51566014). The authors were also grateful to the Analysis and Testing Centre of Inne Mongolia University of Science & Technology for analysis work in this study.